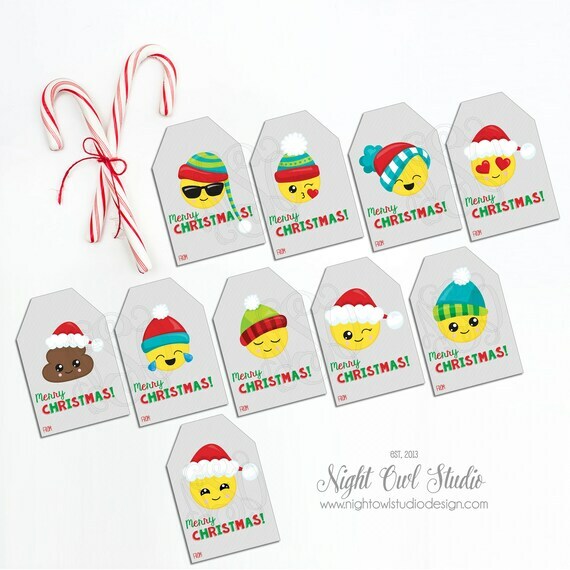 This listing is for our cute Christmas Emoji favour/gift tags as featured in our photo which are available as an instant download file. Upon purchase, you will receive an automatic email notification letting you know the file is ready on the Downloads page. You will receive an 8.5x11" PDF file with 10 tags for easy printing. Each tag measures approximately 3 x 2". You can print as many copies as you need for personal use. Please note: you will need to hole punch tags once printed in order to add ribbon or twine to affix to favours OR you can use double sided tape to affix to favours as well. 2. DOWNLOAD & SAVE: Once payment has cleared, you will receive an email with your download link for your high resolution file. We recommend saving file to your computer or a USB device. 3. PRINT: Once you have saved your file, you are ready to print. We recommend printing on medium to heavy weight card stock or quality sticker paper. Once printed, simply cut along solid lines, hole punch and affix to favours and/or gifts. To see more designs and options, visit us in the shop at: http://nightowlstudiodesign.etsy.com! Colours may appear lighter/darker due to monitor or printer settings. No refunds available for digital designs after your file has been emailed to you. By purchasing this product, you agree to all terms & conditions. © Night Owl Studio Design. All items are for personal use only. Files, either printed or digital, may NOT be shared, sold or reproduced in any way.